Sponsored Archives - Solar Love! The challenges are not atypical of modern living in desirable locations — a combination of cheap imports and high costs of land/rent have created an economy heavily reliant on imported goods, from manufacturing to food to fuel and more. Getting to local self-reliance in Hawaii and elsewhere will require an all-hands-on-deck approach. Solar in Hawaii is a good choice, but with regard to good financial investments, there are few things better than LED lighting. In this article, part of a series sponsored by Pono Home (a local home efficiency and maintenance company), and Hawaii Energy (the ratepayer-funded conservation program), we’ll look at LED lighting retrofits for Hawaii homes. 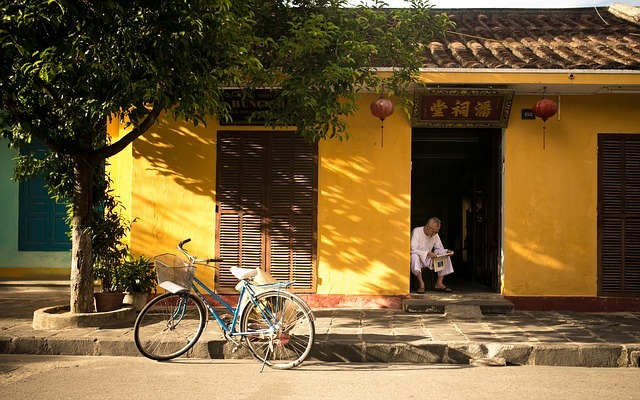 The benefits of such a retrofit include the obvious (lower energy bills) and the not-so-obvious (less heat created inside your home, lower fire hazards, lower risk of burns, less maintenance over time), as well as the community benefits (reducing Hawaii’s dependence on foreign oil). Light Emitting Diode (LED) technology allows for the creation of illumination (light) with lower inputs of energy than conventional lighting (such as incandescent or compact fluorescent bulbs). 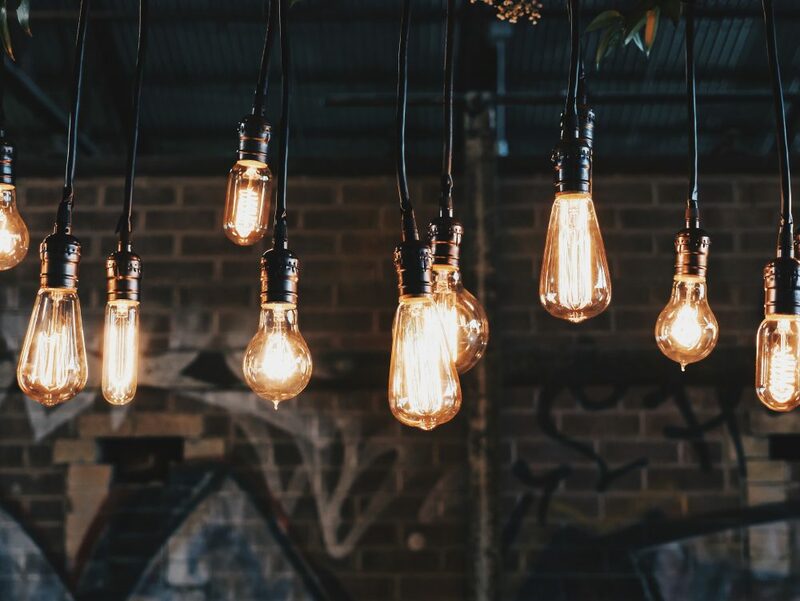 Compared to incandescent bulbs, LEDs use 80–90% less electricity to produce the same amount of light. Over the last few years, LED technology has managed to achieve an equivalent “feel” with its light, matching and often exceeding the options (e.g., dimmability), brightness and color rendering index of more conventional bulbs. Importantly, the price of LEDs, just like the price of solar panels, has dropped precipitously in recent years, making LEDs accessible on a mass-market scale. There are a lot of different types, shapes, color spectrums, brightnesses, and other options available in LED bulbs nowadays. Here’s a visual representation of the most common shapes of bulbs you might encounter in a home. As mentioned above, there are few financial investments you can make that are better than an LED bulb, especially in places like Hawaii where energy prices are high. Multiply the result by your utility’s cost per kWh, and you’ll get a rough calculation of how much money you can save in a year. If you’re interested in seeing more on the methodology for calculating payback periods or return on investment on efficiency upgrades, check out this post. In Hawaii, you can bet that your payback period is less than a year for most lighting applications, far faster for the ones you use most often. So, how do you go LED in your home? For the DIY-er, there are LEDs of most shapes, colors, and sizes at most retail outlets. If you’d like more education and the ability to do a self-audit of your home to identify exactly what you need before going to the store, check out this DIY LED home audit tool. It is also a service provided by our company, Pono Home, so contact us if you’re interested in getting a retrofit! Many people (including myself) have probably wondered something like the following: with solar panels becoming so cheap, why can’t we all put panels on our roofs and go 100% renewable? The obvious answer is that nobody would have any electricity at nighttime. But the issues involving the integration of photovoltaic solar into the grid are more subtle than that. As an outsider to the industry, I struggled to understand how California could be having grid problems (i.e. the “Duck Curve”) when they were only at 6% or 7% solar. After all, 7% is a long way from 100%! I set out with some markers and some graph paper and had an “aha” moment. Let’s start with a couple of terms which are easy to confuse with one another. The first is electrical generation capacity. 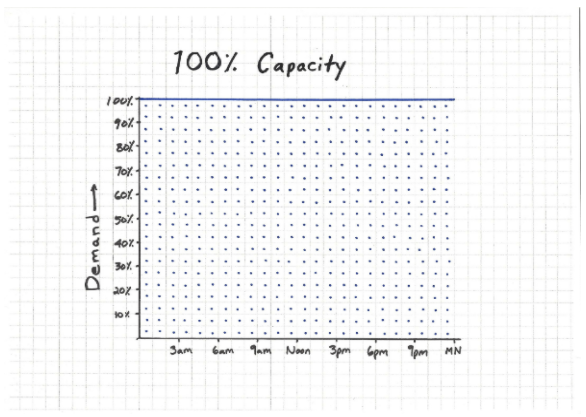 Capacity is defined as the total amount of power a fleet of generators could provide if they were all running at 100% power all of the time. Obviously, this scenario never happens, because it would leave absolutely no margin for error. Nonetheless, you will often see power plants referred to by their capacity. As an example, nuclear plants are the ones that run closest to capacity, whereas simple cycle gas “peaker” plants generally run much less than their capacity because they are only running at selected “peak” times. On the flip side is the amount of electricity that the power plants actually do produce on a given day, which is termed their electrical generation. So, you have capacity on one hand and generation on the other. Typically, an electrical generation system generates somewhere around 70–80% of its capacity. This, of course, varies day by day. 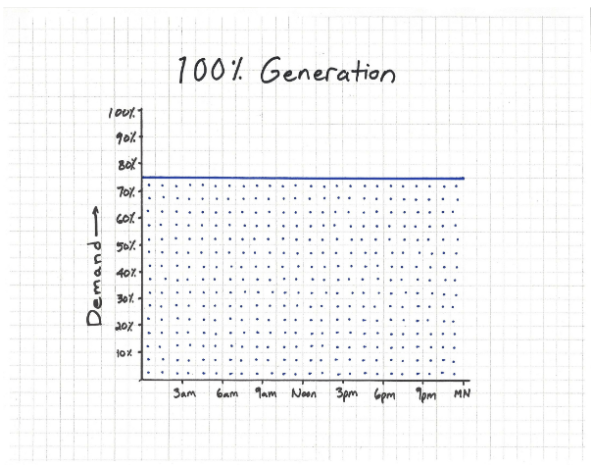 In Figure 1, I have imagined as if all power plants are running as hard as they can all 24 hours. I represented the total amount of electrical power produced with dots. For those so inclined, let’s say that this pretend power grid has a capacity of 20 megawatts. Therefore, each box on the vertical axis represents 1 megawatt. Each box on the horizontal axis represents 1 hour. Taken together, this means that each little box (and each little dot) represents 1 megawatt-hour. As there are 20 boxes vertically and 24 boxes horizontally and 20 x 24 = 480, this means that this grid’s capacity is 480 megawatt-hours (and there are 480 dots). In Figure 2, I have assumed for this thought experiment that the amount of power actually produced (i.e. generated) was only 75% of the capacity. 75% is around average, but remember it can vary day to day. Our generation graph has 15 dots going up and 24 across, so it has 25% fewer dots than in Figure 1, for a total of 360 dots. The electrical output from solar panels is nearly always described in terms of generation. After all, it’s not like the sun can shine on them 24 hours a day. Also, we don’t control things like clouds and rain, so it is not particularly meaningful to discuss the capacity of a solar panel array. Therefore, I will use only generation from here on out. 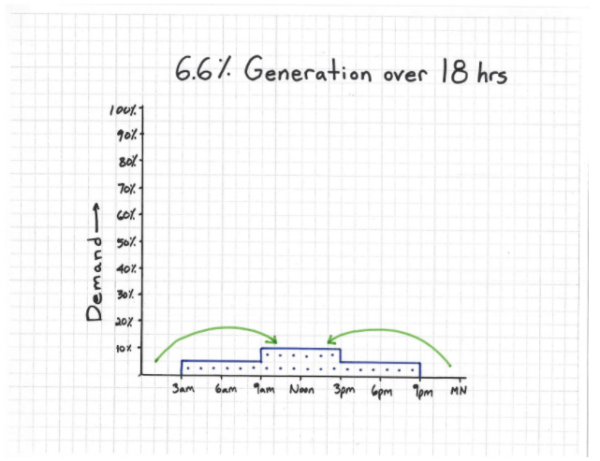 In Figure 3, I have represented 6.67% Generation. Why 6.67%? 360 dots x 0.067 = 24 dots, which looks real nice on the graph. 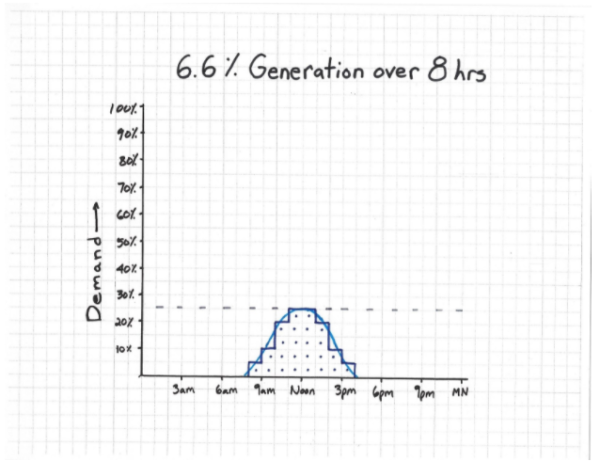 If you had a power plant running at a constant rate that generated 6.6% of the grid’s power for the day, Figure 3 is what that power output would look like. But solar panels do not generate power at a constant rate. Now some magic (okay, not really) — what happens if you have a power plant that produces 24 dots of power but only does so over 18 hours? Still 24 dots here. Count them. I dare you. Now you can see that we’re getting something very close to what Solar generation looks like — a bell curve of output centered around midday (see the light blue line). Even though this figure is still only of 6.6% generation, at its peak, solar is providing 25% of the capacity of the system! 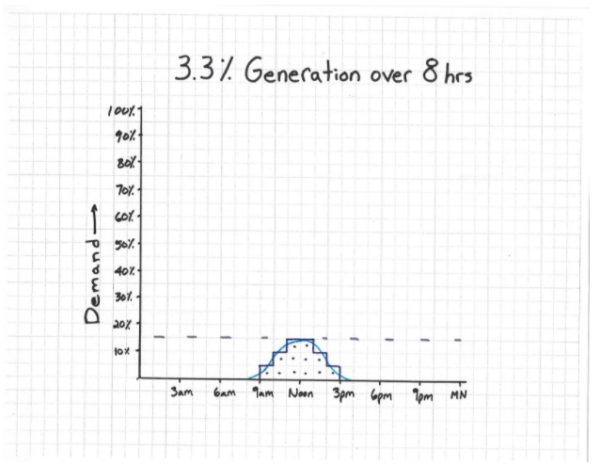 Squishing something that was 6.6% overall from 24 hours down into 8 hours makes a huge difference for how the grid deals with that electrical generation. In Figure 6 things get even crazier. I doubled the generation from 6.6% to 13.3%, which means there are now 48 dots. When the 48 dots are squished into 8 hours, solar peaks at 45%! Grid operation is beyond the scope of this article, but I don’t think it takes much to see that turning massive power plants way down and then way back up just a few hours later (as would be required above) could be quite problematic. A graph from the National Renewables Laboratory shows a strikingly similar prediction for California (see page 14, figure 7). The point is you don’t need to be a statistician at the National Renewables Laboratory to understand how 13.3% suddenly became 45%. 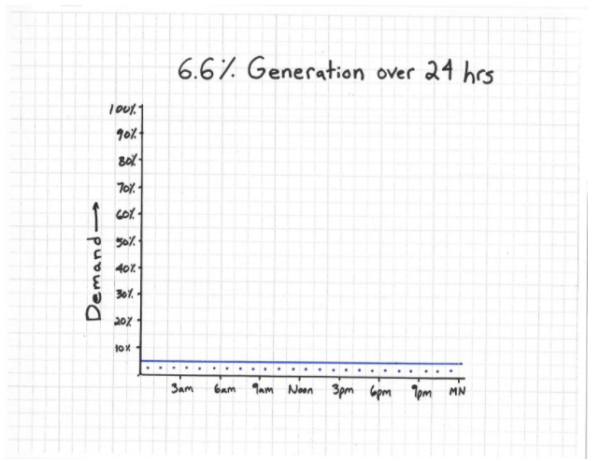 Figure 7: 3.3% generation over 8 hours. In the US, the vast majority of solar electricity is generated in California, so I just wanted to throw in something that is more representative of what is occurring in a state other than California (or Hawaii). Nevada (4.5%), Massachusetts (4.2%), Arizona (3.5%), New Jersey (2.6%), and New Mexico (2.4%) were all in this range as of 2015 (source: eia.gov). Figure 5 had 24 dots, so above in Figure 7, there are 12 dots. 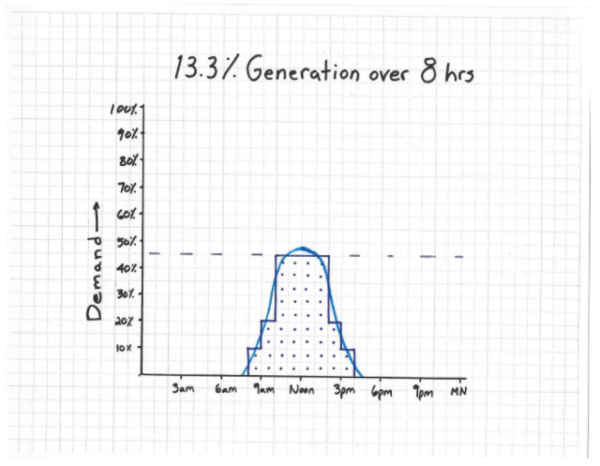 As we can see, 3.3% generation peaks around 15%! When I was learning about the California Duck Curve issue it seemed crazy to me that what at first glance appeared to be a fairly small percentage of solar power could have such a major impact on the grid. However, laying it out on graph paper like this with my daughter’s markers made it so much clearer to me, and I hope to you as well. Inspired in part by Michael Pollan’s “Ominvore’s Dilemma,” I started trying to trace Cincinnati’s electricity back to its sources. With a little research I found that approximately 68% of my region’s electricity was coming from coal. So I read up about the kind of coal plants we have in the area, learning that they are sluggish to respond to peaks or valleys in demand, taking hours or even days to change their “speed.” So that lead me to wonder… if we were to put solar panels on our roof here in Cincinnati, how much CO2 would we actually be offsetting during the time that the panels are making electricity? And would a home battery be better? My website, WhyHomeBatteries.org is an attempt to address these questions. Renewable energy is on the brink of becoming the most sought after power source in history. And why not? Sunshine and wind are free. Once the systems are in place to capture their energy and convert it into electricity, there are no “fuel costs” needed to make more electricity in the future. Add in the millions of tons of carbon dioxide emissions that don’t get released into the atmosphere every year by renewable energy installations, and humanity has a never-before possible opportunity to utilize the power of electricity without polluting the environment. There is one problem, however. Electricity is ephemeral. once created, it needs to be used immediately, or else it is lost. Often, wind turbines and solar farms produce more electricity than is needed right away, which means the excess is wasted. The answer is grid storage, a way of capturing electricity now and being able to use it later. Over the years, pumped hydro systems have been attempted, and they can be quite useful in some locations. For instance, National Grid in the UK has been operating a pumped storage system inside two mountains in Wales since 1982. Excess electricity during the day is used to pump water uphill. In the evening, when the demand for electricity rises, the water is allowed to flow downhill through enormous tunnels, spinning hydroelectric generators as it goes. In Nevada, a start-up company plans to build a railroad up the side of a mountain. A train loaded with concrete blocks will be moved uphill during the day using excess electricity. In the evening, the train will run back downhill, generating electricity along the way. Both ideas are examples of what is known as “time shifting.” Make electricity now, use it later. Time shifting is the key to eliminating fossil fuel and nuclear generating facilities and replacing them with renewable energy from solar or wind. Grid scale battery storage has another advantage. It enables renewable energy to be used closer to the source, cutting down on the amount that sloshes back and forth inside the utility grid every day. Locally sourced electricity needs less investment in substations, transformers, poles, and wires, which can save utility companies money. Alcen Renewables* is a an independent company located in California that specializes in delivering large scale clean renewable energy to the utility grid. It sources, organizes, funds, and delivers high return energy projects that generate clean electricity, income, jobs and independence to rural landowners and rural economies. Alcen Renewables’s mission is to investigate, coordinate, research, plan, organize, and build relationships that get big infrastructure projects off the ground and help them become a reality. Alcen Renewables’s investors are people well versed in private equity financing. They put in the development capital that gets projects shovel ready. Their funding enables us to do the research and put together the permits, contracts, construction plans and long term Power Purchase Agreements (PPAs) that turn a renewable energy development into a stable, long term investment. Once those projects are shovel ready, Alcen Renewables helps create a stable, low risk investment that is attractive to traditional institutional financiers such as JP Morgan, CitiBank and other large investors. As battery storage becomes more common, Alcen Renewables will be directly involved in planning and financing them to promote the use of clean, renewable energy both in the US and around the world. Is the UK solar industry dying due to the ramping up of nuclear subsidies in the country? Finally giving the green light to the Hinkley Point C nuclear power station, the UK government has ended months of uncertainty surrounding this controversial new project. In spite of wide evidence that renewable energy will be much cheaper, cleaner, less dangerous, and more reliable, British taxpayers will now be forced to buy Hinkley Point’s nuclear energy (if and when it comes online) at a guaranteed price of a whopping £92.50 per megawatt hour for a full 35 years, no matter how much the wholesale price of power declines during that term. What does this mean for the UK solar industry? 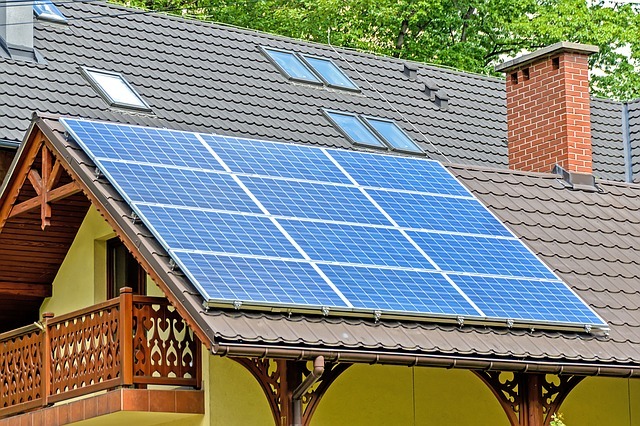 Expertsure, a UK-based home and business energy efficiency firm, states that UK solar PV installers are better off now than they were in 2010. 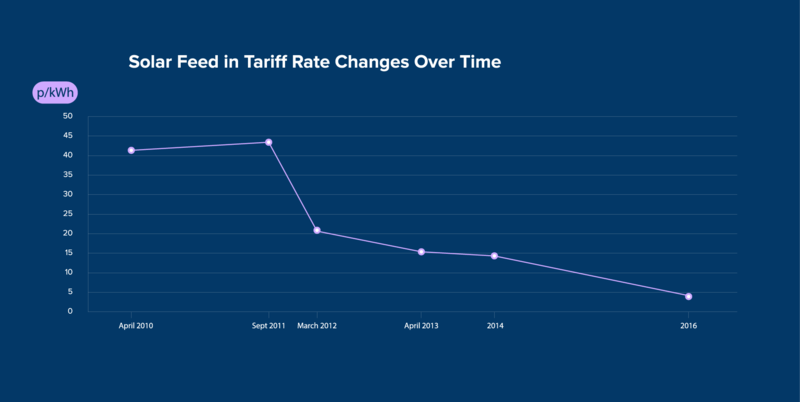 This is in spite of the fact that in 2010 the feed-in tariff (FIT) rate was 41.3p/kWh, and today’s FIT rate in the UK is a mere 4.39p/kWh. In the wake of these dramatic subsidy cuts and installation decreases, over half the jobs in the UK solar industry have been lost. Incredulously, government overspending was cited as the reason for cutting subsidies for wind and solar. Under the previous coalition government, a cap known as the levy control framework allowed spending to reach £7.6bn a year by 2020–2021. However, the UK government cited fears that household energy bills would be pushed up to support an overspending of £1.5bn by 2020, so they were “forced” to cut renewable subsidies. £92.50 per megawatt hour of nuclear-generated electricity output is more than twice the current wholesale price, and, with a 35-year price guarantee, it is clear that overspending on nuclear is a moot point in England. They were clearly just making room for it on customers’ household energy bills at the expense of household solar rooftop installations. Reportedly costing £18 billion ($23.7 billion), this will be the first civil nuclear power plant built in the UK in over 10 years. £12 billion of this cost is to be provided by the French state-owned energy firm Electricité de France SA (EDF), and £6 billion is to be provided by EDF’s partner, Chinese state-owned General Nuclear Power Corporation. The two foreign partners will design, build, and operate Britain’s new Hinkley Point C nuclear plant. In fact, the NAO pointed out that the subsidy bill that households and companies would pay for Hinkley has “more than quadrupled since the agreement for the new nuclear plant was signed in 2013.” The difference between the wholesale price of electricity and the guaranteed price of £92.50 (which is index-linked to inflation), would be “topped up” via a levy tacked onto customers’ energy bills. In 2013, when the deal was signed, the lifetime cost to consumers for this subsidy was projected at £6.1bn. However, the NAO said, significant cuts to official power price forecasts have dramatically increased the resulting income that Hinkley’s EDF developers will receive from consumer-funded subsidies. Imagine that. Just follow the money and all this overspending on new nuclear power finds an obvious explanation. 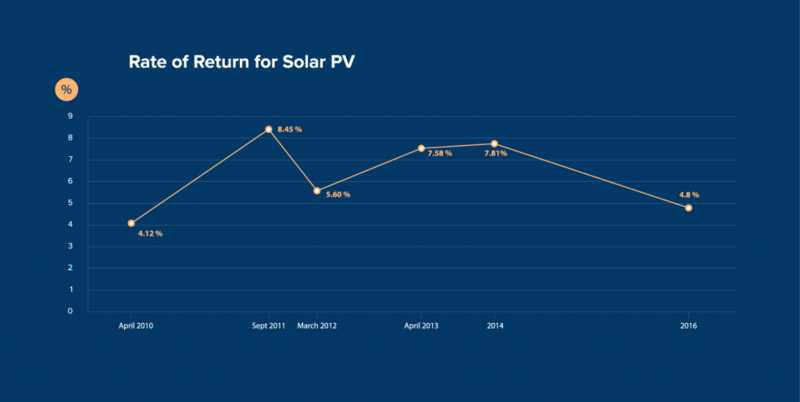 In 2010, when UK solar incentives were at their highest, according to Expertsure, the average rate of return on a domestic solar installation was 4.12%. 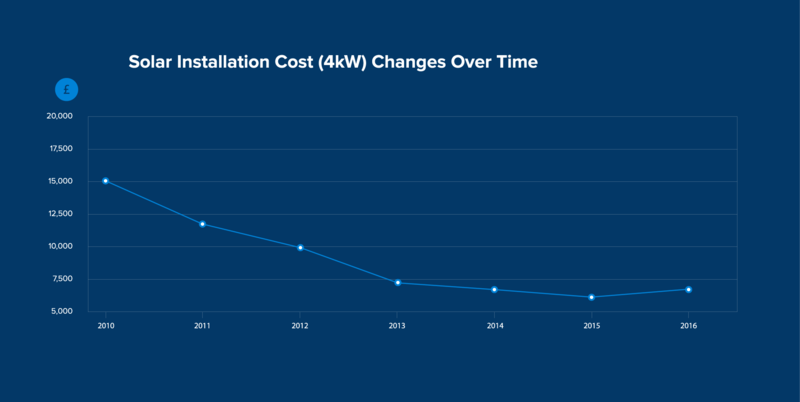 Today, with the cost of solar installations decreasing an average of 62% since 2010, the average return on a similar solar installation is 4.8%, higher than back in 2010. In spite of governmental axing and slashing of UK solar and wind subsidies since coming to power in May 2015, however, renewables are still hard at work in the country. In the first quarter of 2016, renewables generated 25.1% of the UK’s electricity, according to government data published in August.